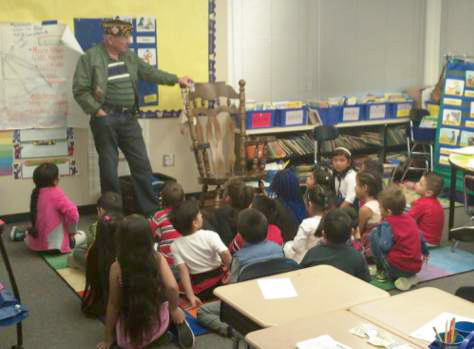 Eleven Members of Edmonds VFW Post 8870 participated in the Veterans in the Schools project in the run up to Veterans Day. 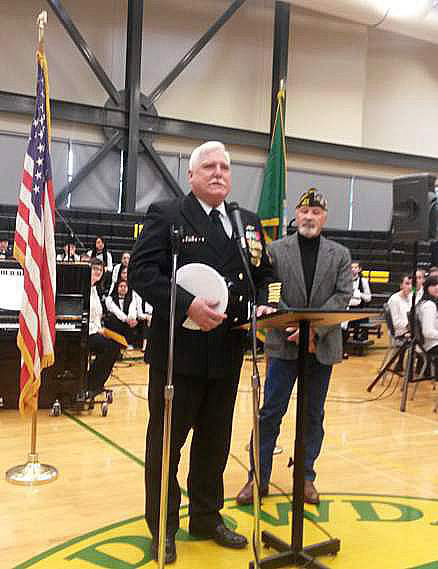 Jim Blossey kicked off the week by acting as Master of Ceremonies at the Edmonds Community College Veterans Day event, held on Wednesday November 7. The program featured recognition of the 100th anniversary of the armistice ending World War I. There were several other Post members in attendance. Many thanks to all who volunteered. On August 4, 1914, Germany invaded Belgium to begin one of the most devastating wars in human history. By the end of that war, more than 15 million were dead from 28 different countries. Millions more were wounded. 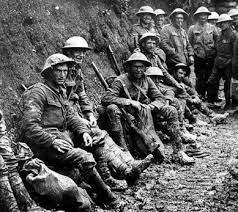 It was the first war that could truly be called a world war, with fronts in Europe, in the Middle East and Ottoman Empire, and in Africa. Some of the battles that would become famous in that war, like the Battle of the Somme, witnessed such carnage that the human mind could not comprehend it without teetering on the edge of insanity. Countless veterans would come home from suffering the effects of wounds caused by weapons that were used for the first time in history: the tank, the machine gun, aerial bombing, and gas/chemical warfare. Tens of thousands came home suffering from psychological wounds so profound that the medical profession could only name the phenomenon with the language of poetic metaphor: shell shock. The war raged across the world for four long years, leaving death and destruction in in its wake. 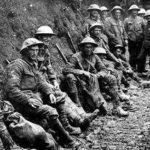 It would finally come to an end not so much from clear victories as from the sheer exhaustion of the populations of Europe, no doubt aided by the entry of the United States in 1917. The Russian government would collapse in March of 1917 and the Bolshevik Revolution would begin in November of that year. On November 4, 1918, the Austro-Hungarian empire agreed to an armistice. Revolution was rumbling in Germany as well, and Germany finally signed an armistice on November 11, 1918. We still celebrate that event to this day, now called Veterans Day. At the end of the war the Austro-Hungarian Empire and the Ottoman Empire, both of which had reigned for centuries, no longer existed. Past Commander Jim Blossey is now scheduling volunteers to participate in our annual Veterans Day in the Schools program. Participation ranges from simple attendance to be “saluted” by the students, to question and answer sessions in classroom settings to speaking to student assemblies. Your editor has participated in all three types and found them all gratifying. White, appearing the schools on prior Veterans Days. In recent years we have had more demand from the schools than we have been able to fulfill, so your participation will be appreciated. Veterans day is invariably a school holiday, so most of these programs are held the preceding week, generally late in the week, with the most popular day being the Friday before the holiday. If you are able to participate, please email Comrade Blossey at jamesblossey@comcast.net. He will schedule everyone and let you know where and when you are expected. “Had a great visit on Thursday the 10th at Sherwood Elementary School located in the Woodway area. An all-school assembly began at 10:50. The students filed in and we began with the Pledge of Allegiance followed by the acknowledgment of the four Veterans in attendance, including me, a vet from Legion Post 244 someplace back east, and two other vets, one Vietnam and another Korean era. The assembly included a white table ceremony that was conducted by a teacher and students using a description of the ceremony and its significance that has been described in a children’s book. After the assembly one of the teachers asked me if I could spend some time visiting with her fifth graders which I did, visiting with two fifth grade classes at the same time. The kids pelted me with questions for an hour or so which I enjoyed answering as best I could until recess and continued to answer questions outside the classroom during recess. 8870 member Jon Koenig speaking at Meadowdale MS with Post Commander Terry Crabtree. 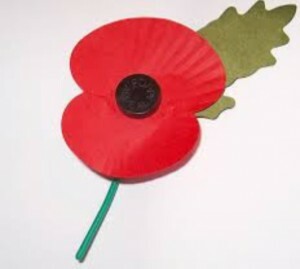 Sign up for Poppy Distribution. Veteran’s Day is officially Wednesday, November 11. 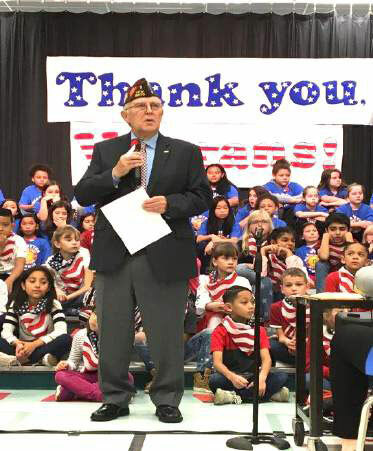 During the days leading up to that week many of the schools in our service area will have special programs honoring veterans and educating the students about service and sacrifice. By the time you read this, we will have sent letters to all the schools offering to provide one or more veterans to come to any school requesting them. Some will be asked to speak before an assembly, others to visit a small class, and some to simply be present while the young people honor us and show their appreciation. At our Post meeting on October 13 those in attendance will be given the opportunity to volunteer to visit these schools. Those who have done so in the past always come away moved and grateful for the remarkable young students and the teachers inspiring them. If you are unable to be at the October meeting and you would like to sign up, you can do so by emailing Commander Blossey at blossey.james@gmail.com. November 6 & 7 at four locations. If you haven’t signed up for a shift, see Bob Crawford. This should be an all hands event. Bob Crawford is our chairman of our Buddy Poppy distributions and set another record on Veterans Day weekend. This year we raised $12,227 while our volunteers spent a couple days at four locations. We were fortunate to have a fourth store after Tops Food closed their location in Edmonds and we were left to struggle to find a replacement. Fortunately, Fred Meyer allowed us to distribute Poppies at one of their locations allowing us to add $2,200 from that store.